I imagine all of us gardeners, from time to time, just loose interest in a plant. Maybe it doesn't perform as well as it should, isn't quite the right color, gets diseases or flops. Sometimes, tastes just change...and things we were obsessed with just loose their luster. Over the past year, I've realized that I'm completely over Euphorbias. It's sad, but true. 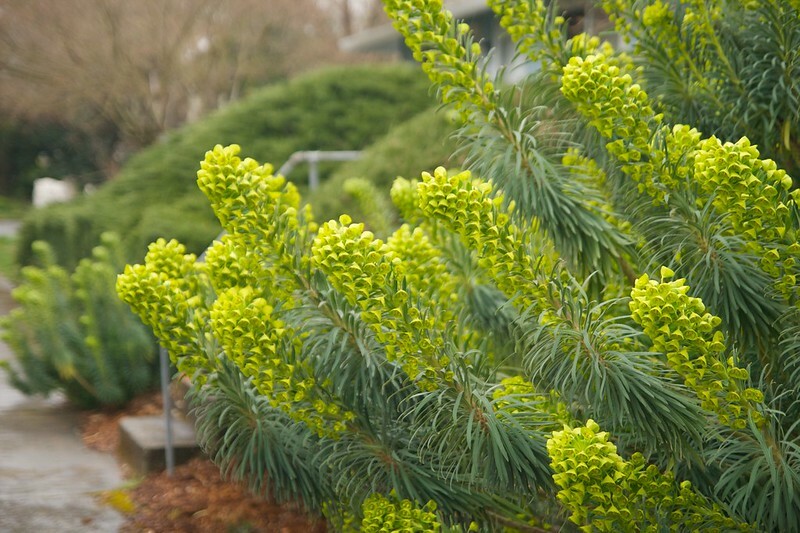 I remember, soon after moving to Portland, being amazed at all the enormous Euphorbia wulfenii around town. 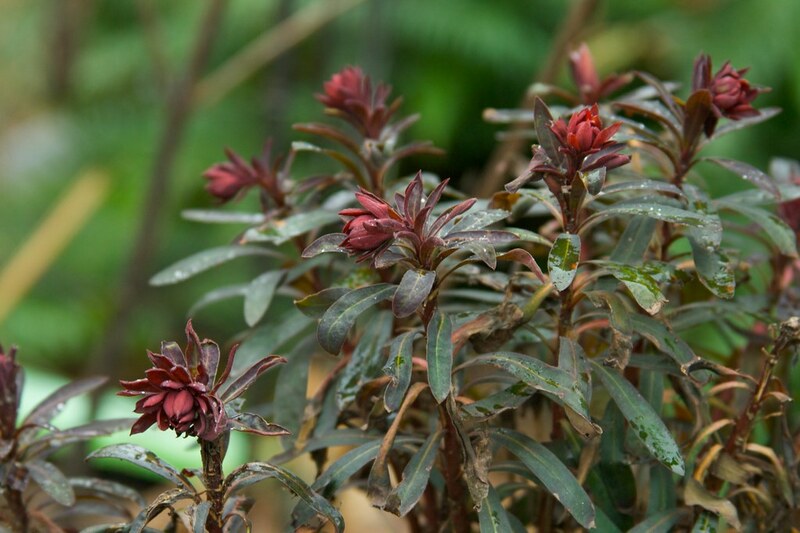 Even though I thought there were pretty cool, however, they never intrigued me like the darker-leaved varieties did (and honestly, every house in Portland seems to have at least one Euphorbia wulfenii). First I planted 'Blackbird' and loved it all winter long...then, it bloomed in spring and became a sticky, buggy mess. I cut it back, but it never looked good again, so I yanked it out. Next came 'Blue Jeans', which I dearly loved when I planted it...however, the same thing happened...after blooming, it became a straggly, woody mess..and just never looked good after that...looking kinda crappy for the rest of the summer. Oddly, they always seemed to look at their best during winter. I enjoyed them last winter, and once they bloomed this spring, out they came. Then, a few years ago, I found this Euphorbia...Euphorbia griffithii. I loved it! 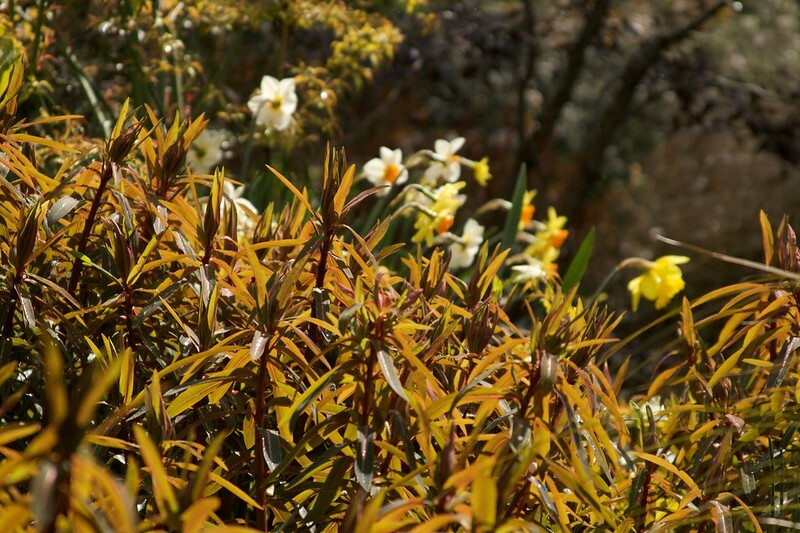 Deep, somber maroon-tinted foliage in spring, followed by glowing, ember-like blossoms in late spring. The plant above is a mature clump I spotted at Joy Creek a few years ago...and I wanted one! I didn't have luck finding any for sale around town, until the Spring Yard, Garden & Patio show a few years ago. I bought a bare root plant (a smaller, less thuggish variety called 'Dixter') and was so excited. I know what you're thinking...finally, he found a Euphorbia he could love. Well, not really. Partly, I think I just don't have luck with buying bare-root plants...well, except for my enormous Amsonia (which I bought bare root on eBay), which looks awesome. My 'Dixter' has only produced two stems each year for the past 3 years. Each year, I keep expecting to see at least one or two more shoots...but no such luck. You see, once the heat of summer arrives, 'Dixter' turns a plain, boring green...and gets utterly lost in the garden. The stems stay a decent reddish color, but they aren't enough to make the plant interesting. To be honest, right now (late October) there are quite a few plants in my garden equally as guilty as 'Dixter' of being sprawling, green masses, but, without exception, their seasons of interest are still much longer than 'Dixter'. So, since I have the tiniest garden ever, and don't suffer a plant I don't at least sort of love, it's coming out next spring. Here's the question...what should I put in its place? I'm seriously considering moving the trio of Agastache 'Desert Sunrise' to it's old spot (well at least one of them...it's not a huge area), since they are starting to get shaded out by the ever-expanding bulk of the Eutrochium nearby. Honestly, however, those Agastache could find another home somewhere even sunnier (perhaps one of the parking strips). In that case, what would you plant here? Have you ever falled out of love with a plant...it seems inevitable, doesn't it...after all, we're always changing...and it makes sense for our gardens to change with us, right? Nope, haven't fallen out of love with euphorbs yet, you fickle-hearted man. Just kidding! I agree, they can look miserable. The E. characias 'Silver Swan' has been wonderful, same for E. rigida. Blackbird never liked my garden, nor griffithii. E. lambii looks better this fall, but it's tender. Hey, there's lots of other plants, and look how much agastaches adore you. But you've gotta admit your photo of wulfenii in full bloom is stunning. Hahaha...I AM that, aren't I! I totally agree, wulfenii are one of those amazing things in spring that you just can't help but love! I definitely fall out of love with plants. A good example is downy sunflower. I loved this plant from afar. However, when it achieved it's full size I had to admit I was disappointed. It was big but not very full, and the bloom period was short lived. I told myself its shortcomings didn't matter, and even wrote a post about how it's beauty was in the evocation of the lost tall-grass etc. Then one day I said to myself: "Who am I kidding? This is a stupid plant." But it upsets me that you would disparage hardy geraniums. A person tired of hardy geraniums is tired of life. 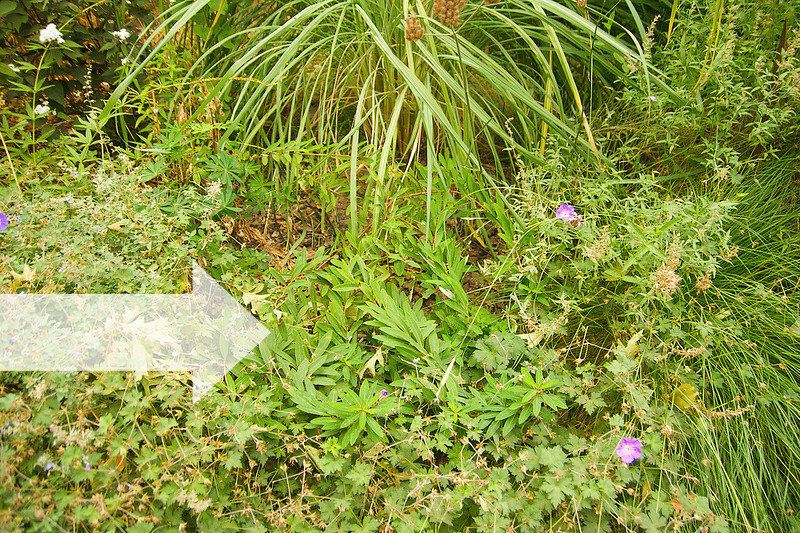 I can see why you want a dark-leaved plant there -- lots of green! No suggestions right now though. Something with larger leaves would look good, even if it's just green. I have Euphorbia Blackbird also and I am going to pull it, does nothing for my garden. Lately, I have been rethinking many plants in my garden, especially the roses which have been through everything this year. I think it's really just a part of a garden's evolution, isn't it...they change as we change. I have sort of fallen out with aeoniums. I used to have loads, but I just couldn't over winter them, and none ever got to the size or look I was after. So my collection has be reduced to one cristate plant. It happens to me a lot, and I am sure it happens to others too... Plants go in and out of fashion all the time, so it makes sense we also fall out of love with the plants already in our gardens. Never been a fan of Euphorbia- don't own any, other than the spurge which pops up like a weed around the garden in late summer/autumn and no matter how much I pull out, there's still more; and it seems to appear overnight. Oh yes...that's the thing with some of the Euphorbias...they can be noxious weeds in the wrong place. You said it would last forever. I don't know what makes me sadder; that you no longer love me or that you've shared your newfound indifference towards me in such a public way. I thought that our relationship was firmly rooted and blossoming into something truly special. I'm crushed as I still feel the same as I always did about you. Can't we work this out? HAHAHAHAHAHAHA...breaking up is hard to do! P.S. I fall out of love with plants all the time. I know how you feel about Euphorbias. I loved them when I lived on the east coast where the cool ones are only marginally hardy. Now that I live in California they are so common here. Have you tried E. 'Blue Haze'? That might respark a little of your love for them. I too fell out of love with Euphorbias this past Spring and removed every one of them. I think we all have the same inspiration at the same time, due to the nurseries pushing them on us. A couple of years ago Euphorbias were the go to plant at the time. Hahaha...so true...there's nothing quite like an enticing display at a garden center to quicken the pulse, right? I'm one of those people Kaveh speaks of on the eastern part of the continent. Several years ago I took a shortcut across a huge parking lot...and it was filled with tall Euphorbia "WEEDS". I've felt a bit differently about them since, but not enough to rip my dark foliaged ones out. What about putting an aster in that spot? Hmmm...that's a nice Idea...it would certainly add a pop of color right now! I fell head over heels in love with hellebores then I lost interest...Now I am wanting them back! Hahahaha...oh no...that's always the fear, isn't it...we get rid of something we're tired of...only to see it elsewhere and want it back! Whew! You're talking about a plant. I was a bit worried when I saw your blog headline. I don't know...I don't really fall out of love with plants. Except for the ones that choke out other native plants. The non-native bullies have to go. I wish I had E. wulfenii in my garden! It's gorgeous! Ah yes...those bullies are something we really have to get rid of...I've lost count of the blackberries and black walnut seedlings I've pulled up this year! I've killed a buttload of various Euphorbias. The ones that are still doing okay are my green and white 'Tasmanian Tiger' but this is the third try. I still like my 'Ascot Rainbow' and my Euphorbia cyparissias ‘Fens Ruby’ even though it spreads. 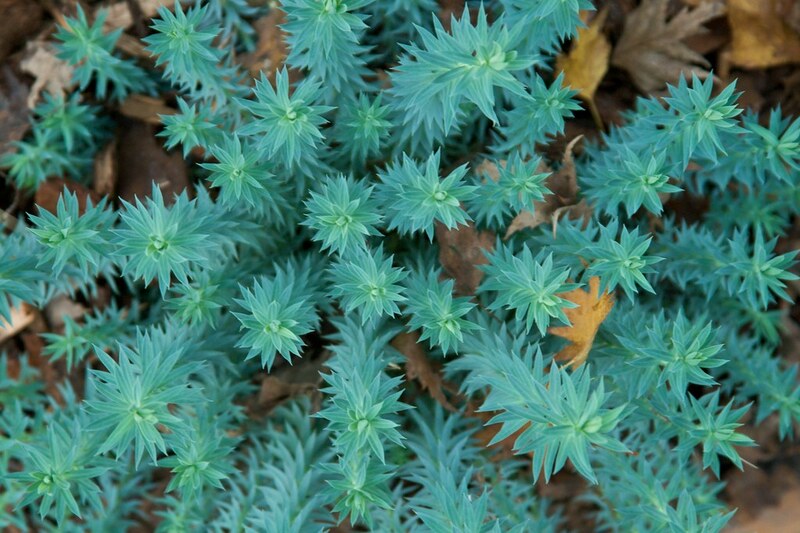 And Euphorbia myrsinities in my rock garden. I've fallen out of love with so many plants I don't even know where to begin. Great topic! I have fallen out of love for any rose that is finicky or diseased. I have to say, I have never been a huge fan of euphorbias,but the fact that they are deer-resistant is a plus.Is it only me that thinks that some of them look a bit, well, alien-ish? Ahh yes...I try not to grow anything that's too susceptible to any sort of disease...too much work! It seems that there are acouple of plants every year that I look at and say "what was I thinking! 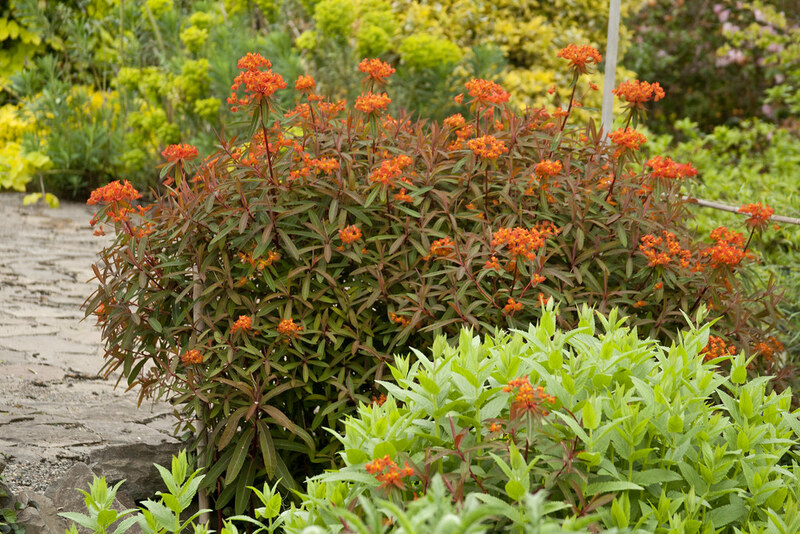 "...luckily there are always new and exciting plants just begging to be purchased. So for your empty spot....how about a division of my Chasmanthium latifolium? I was first going to suggest a nice dark leafed Canna but then realized since you don't have any in your garden you probably don't care for them. Haha...glad I'm not the only one...and to be fair, I've seen it elsewhere looking lovely...just not here, sadly. Generally, you're totally right, I'm not a fan of most Cannas...but I did see one this summer that I've actually been thinking would work well in this spot, Canna 'Intrigue', it's got thinner, more lance-like silvery-purple foliage. The only thing that kept me from getting one this summer were the blooms...but then I just figured I could lop them off, right? The way we garden today, that is, our almost knee-jerk response to new and improved plant varieties, makes it very easy to fall out of love with an old plant or an older variety. I've recently allowed myself to fall out of love with plants and remove them from my garden. It helps that I have effectively run out of room, so something has to come out every time I want to put something in. This is totally out of left field, especially in your garden, Prairie Boy, but how about a small conifer there? I could see the deep green or blue green of needles setting off the other colors beautifully. I envision something wider than it is tall, probably in the pine family. That's my two cents - keep us in the loop! This has got to be a thrill...a spot for a new plant. I see an Acanthus there, but that's just me. If the idea appeals to you, I have a ready supply of both mollis and spinosa. Yes, plants are constantly misbehaving and being cut out of my will. Grace's Euphorbs are great, variegated. I have plant lust for them. I have been encouraging some 5-6' Gopher's Purge in my vegetable garden to discourage the voles, it seems to be working along with lava rock. 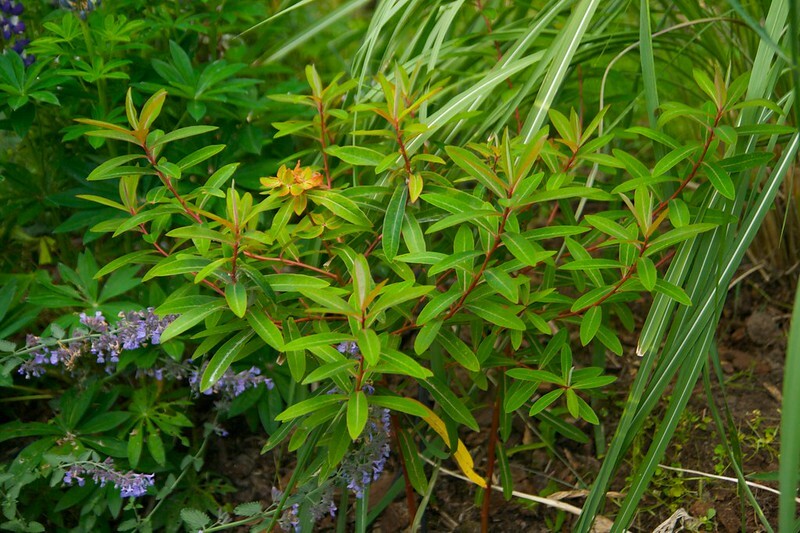 I have some dark small Euphorbs that self-sow around the garden and have nice chartreuse flowers, and I like their drought tolerance, so they get to stay, as well as some E. wulfenii, which have not self-seeded rampantly for me, and are charming in the spring but not so much the rest of the year. I could see a burgundy or striped canna in your spot too. I finally got a Cotinus this year which would look great there but they can get very big. I've seen photos of some that were kept small by a lot of pruning but I don't know how well that works. Surprisingly, a Canna is precisely what I've been thinking of...I'd love to grow Cotinus...but my garden is definitely too small! I've turned my back on Ligularia. I was in my big, orange, dark leaf phase, and now am over it. There is not enough water on the planet to appease these aqua-sucking monsters. But, I still admire their ability to be orange, have big leaves and bloom in the shade and draw bees. I'm a bit of a girl aren't I - not quite over him. Suggestions - would love to see something big and beefy - do you hate those saucy hibiscus? Something new, but well recommended is Salvia lyrical 'Silvertone'. 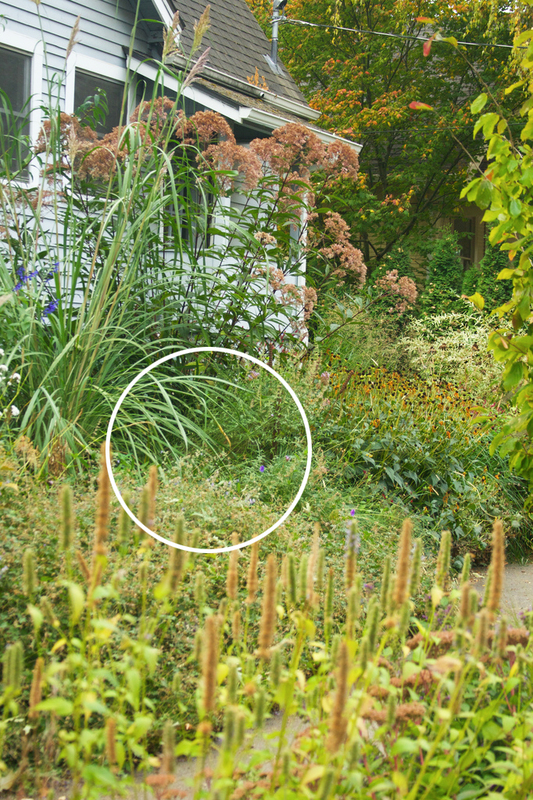 Maybe Miscanthus 'Goldbar' if you weren't completely done with grasses? OMG, Barbara...me too! I love Ligularias...but there is just no way to keep them from drying out! I learned that lesson the hard way...sheesh! Apologies if this comment is inappropriate. Readership is the life blood of any Garden Blog! For Gardening Blogs Just Like Yours. I'll take a look, Andrew...I seem to remember hearing about that elsewhere. There are many Euphorbia that I am with you on....nice until they are sprawling and an icky mess. HOWEVER, I have Ascot Rainbow and so far, love it. The variegated foliage is nice. Have a group of three, one of which is doing a lot better than the other two. I have thought about cutting the blooms off before they come into bloom next year. That's exactly what I should have done with mine, Janet...prevented the flowering altogether, which seems to trigger a general messiness! Kalimeris incisa or maybe a echinops? I have no idea what Kalimeris is...will have to look that one up! I do love Echinops...that's a good suggestion! An Agave for that spot! I pulled out all my wulfeniis, never all that thrilled with them, just respected them for growing on zero water. But it was never ever love...mea culpa. Hahaha...I think that spot would be instant death for an Agave (or an sun-lover)! I agree...the wulfeniis are tough...but except for about 10 days in spring, are kind of a bore. I am right there with you. I am done trying to make euphorbias work in my garden. What about something blue for this spot? I love that idea...I sort of wish there was room for a little urpright blue conifer...but I don't hink there's quite enough room for something like that...and I'm clueless about conifers! If you want to try new plants, you have to fall out of love with the old ones sometimes. Either that or get a bigger plot. Funny comments from outlawgardener and Norm! Euphorbia wulfennii totally knocked my socks off when I first saw it around Portland too. So chartreuse! Architectural! Mediterranean! I think I will always love it but I'm following in your footsteps now by experimenting with more exotic varieties. I have definitely fallen out of love with plants before -- part of the process of gardening, I think. But I am still in love with euphorbias, probably because they are not so rife here as in your region. Only E. rigida has performed well for me, and I absolutely love it, even though it tends to sprawl. But great foliage all year, cool chartreuse blossoms, and the deer won't touch it. Everyone who walks by my house asks what it is (which shows you how euphorbias aren't well known here in Austin). I love the idea of a conifer in your empty spot, but, gosh, you guys can grow anything in Portland. I'm sure you'll come up with something fabulous! a été bloqué temporairement. vêtements de devant r�pertoire piratage compte facebook en ligne.